Available as of 2-19-2015 with open ends only - 4 kits left in stock. Our original Motorcycle grip. First manufactured in 1981.�OUT OF STOCK and NO plans for any more production. Fits motorcycles with 7/8" handlebars and 1" throttle tube�and ATVs with 7/8" and 1" handlebars.�This grip is 5- 3/16" long.�SLENDER�Profile -� Smaller outside diameter than our more recent models. 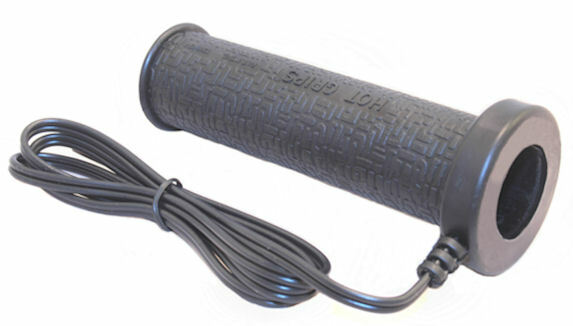 Good choice for those wanting a smaller diameter firm grip.�Patented burn-out proof heating coils�Dual Heat - all our grips�have a weatherproof 3 postion toggle switch allowing you to select high, low or no heat. Custom Options: Handlebar mounted switches and an electronic variable heat controller are available.�Can be installed on motorcycles with .875" handlebars or ATVs with .875" or 1" handlebars. Supplied with two bushings for the .875" diameter applications.� The bushings have an i.d. of 7/8" and an o.d. of 1". Required Adhesive: Epoxy rated at 250 F.
NOT for aluminum handlebars, as the aluminum acts like a heat sink, drawing away much of the heat.� Filling aluminum handlebars with ANY form of insulation is virtually ineffective.